Elizabeth Ann “Liz” Stark, 84, died Sunday, March 31, 2019, at the Vinton Lutheran Home following a long illness. Funeral services will be held 11:30 a.m. Friday, April 5, 2019, at Blessed Hope Community Church in Vinton with Rev. Matt Hantz officiating. Visitation will be held at the church on Friday from 10:00 a.m. until 11:30 a.m. Interment will be in Evergreen Cemetery, Vinton. Liz was born October 31, 1934, in Ringold County, Iowa, the daughter of Julian Card and Elsie Marie Saville Galloway. 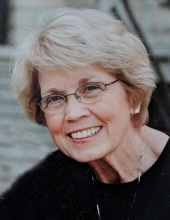 She attended Redding High School in Redding, Iowa, and went on to receive her Bachelor’s degree from Taylor University in Upland, Indiana, in 1957 and her Master’s degree in library science from the University of Northern Iowa in Cedar Falls in 1984. On June 8, 1957, Liz was united in marriage with Kenneth John Stark at First Methodist Church in Upland, Indiana. He preceded her in death on November 12, 2018. Liz was an elementary school teacher and librarian, and she held teaching positions in Springport, MI; Waterman, IL; and Kewannee, IL. She taught in Vinton from 1968 until her retirement in 1997. Liz was a charter member of Blessed Hope Church in Vinton and served on the Fellowship Committee. She was also a member of Mentor Club and the State Library Association. Liz is survived by three sons: Michael (Lucille) Stark of Wakefield, RI; Tom (Alissa) Stark of Minneapolis, MN; and Steve (Debi) Stark of Cedar Rapids; her siblings: Rex Galloway of Villisca; Helen Whitenack of Angola, IN; Jim (Marilyn) Galloway of Creston; and Kris (Susan) Kozel of Urbandale; 9 grandchildren: Joel (Megan), Elizabeth, Avery, Devin, Lamar, Rhiana, Allison and Marissa Stark and Breanna Hawley; and 2 great-grandchildren, Harper Stark and Brooks Hawley. To send flowers or a remembrance gift to the family of Elizabeth Ann Stark, please visit our Tribute Store. "Email Address" would like to share the life celebration of Elizabeth Ann Stark. Click on the "link" to go to share a favorite memory or leave a condolence message for the family.